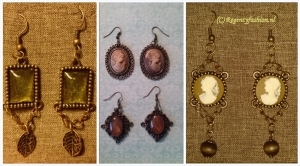 Make your Regency outfit complete with matching jewelry. Jewelry can be ordered or make your own during a workshop. For questions or ordering you can send an e-mail. Necklaces with glass stones and cameos in mosgreen or purple €14.-. Necklace with lace and pearl-beads in cream & copper 14.-. Necklace, bracelet and earrings with cameo pearl-beads, ribbon and lace. In grey & blue or cream & black or brown & dusty pink. Necklace €12.-, bracelet €4.- to€6, earrings €4.-. Necklace with cameo pearl-beads, ribbon and lace. In créme & black or black & red €12.-. Workshop costs € 11.- excluding materials. Order costs (excl. postage) Necklace €12.-to €16.-, €4.- to €6. Bracelet, earrings €4.-. More info see workshops. For questions or ordering you can send an e-mail.